A Timeless Beauty. Elegance and sophistication that never goes out of style, our Hemstitch has traditional delicate stitching within this linen/cotton textile feel. A charming reminder of the textile heirlooms of our family through history, your guests will feel at home at your next time-honored celebration. 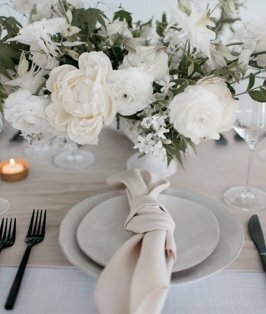 Our White Hemstitch Napkin has a 1 1/2" border and is as crisp as they get with this pure color (or as it is defined as the color without hue). Be inspired by the Photo Galleries for additional ways to make your next event as unique as you are.